The next stop on our Road Trip USA Deep South Tour after Tallahassee was Mobile, Alabama. We had just under 24 hours in this city to explore. It was only a short time, but since we wanted to be in New Orleans for J’s birthday, we didn’t have a choice. 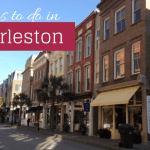 Thankfully, 24 hours was long enough to give us a taste of this city as well as check out some of the things to do with kids in Mobile AL. 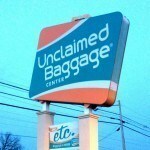 We did not find it the easiest city to find personal experiences about so hopefully this article will help you. I do want to add that we arrived in Mobile on Black Friday – things were quite dead which was not something we expected, but I have since been told is quite normal. Not being American, we had no idea what affect the long weekend might have on things. Here are the details of what to do in Mobile Alabama with kids, as well as other information about our time there to help you have a great visit. After checking in (see below for accommodation details), we headed straight for downtown Mobile. One of the main things to do in Mobile AL with kids has to be visiting the downtown area. We had a shock when we arrived, it didn’t feel like the downtown area of a city at all. There were empty blocks and houses in the middle of things. It was also basically empty of people apart from people sitting around in a way that did not make us feel comfortable. Because of this, we didn’t do the big walk we had planned, but parked on Dauphin Street and just walked up and down here. It felt sketchy. 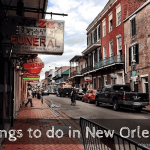 Dauphin Street is the main street and is compared to Bourbon Street in New Orleans in our guide book. Now that I have been to both, I find that comparison strange. There is not much on Dauphin Street, just some shops, restaurants, bars and it lacks the people to have any real energy. We walked down to the river front but did not hang around long. We talked to a local during our walk who explained that everything was shut that day because of Thanksgiving (it was Black Friday), and that the next day there would be a lot of people around thanks to the shops re-opening and having sales. So it sounds as though we were just unlucky with our timing. We went back the next day. There were more people around but not many more and my impression did not change much from the previous day. We are finding on this road trip that we are having to rethink how we imagine cities. Back in Australia, they always seem to have a clear CBD and lots of shops and activity. This is not how we are finding places here at all. The shops all seem to be out in the suburbs. We had been going to eat dinner there, but there wasn’t anywhere that appealed, so we headed back to our hotel and ate in one of the many places around there. The following day we also drove down Government Street as we had read there were lots of grand old houses. There is and it’s enjoyable to drive around and have a look. The next morning, we headed back into the downtown area and to Fort Conde. Fort Conde is a reconstruction of the original. 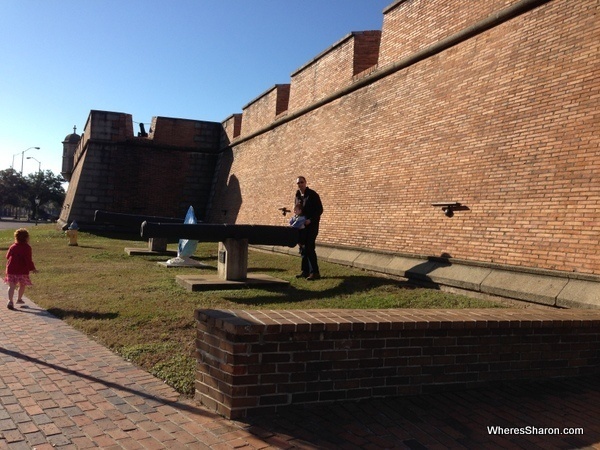 It was originally built by the French in 1723 to guard Mobile and its citizens. It doesn’t look like much from outside, especially as it borders the interstate, but the museum is interesting and it’s free. 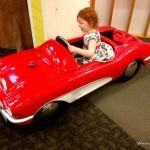 It works out well as one of the things to do in Mobile Alabama for kids as there is plenty of space to run around. We enjoyed learning a bit of history of the area and I’m sure older kids would enjoy this aspect as well (our kids were just 1 and 3). 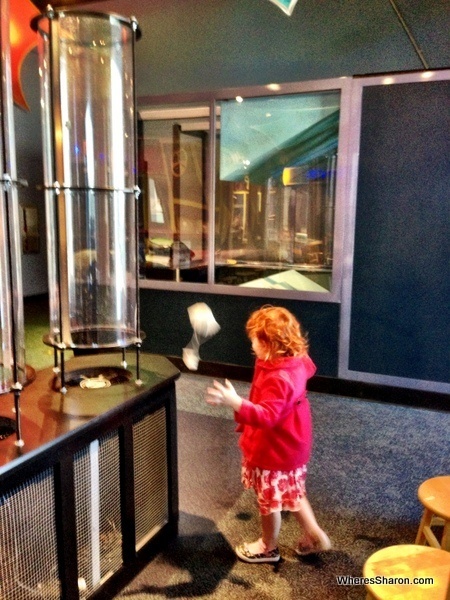 This was our favorite things for kids to do in Mobile AL, and is a great science museum for kids of all ages (and adults, J is still talking about it a lot!). Initially, I was very disappointed. The entry price was higher than what was stated on their website and the first room we went into about how bodies work was not good. Many things didn’t work, and it seemed aimed at secondary students or adults more than kids. Thankfully, the other rooms were brilliant. We all loved the “hands on hall” and “Tinker Works”. There were so many hands on activities for us to do. Both J and I got into it as well. There was no need to learn the science behind things to have fun and experiment. I especially liked the Tinker Works area as there were a lot of different things to build with kids using items such as pipes, cups and string with instructions. There are also ways to try out your designs to see if they are any good. For example, S and I built a parachute and there was a wind tunnel to try it out in. We could have spent all day in this room. Just brilliant! 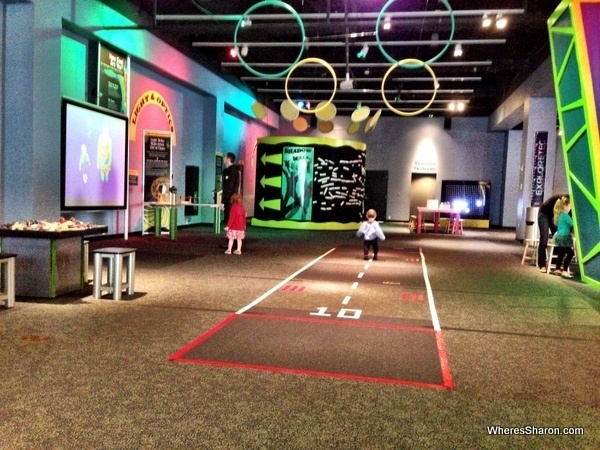 I think this museum is where you will find the best kids activities in Mobile AL. There is also a chemistry lab with an assistant who did a chemical experiment with S and a great play area with a big boat with ball pit ocean complete with plastic fish and a light house! It was very cool and both kids could have played in this room alone for hours. If you can’t tell already, this place was a big hit with all of us and S keeps asking to go to museums now! There are so many things to do in this center. Z loved it all as well. He would join in on the family tug of war, dance behind S in the virutal reality game and he LOVED the boat play area. However with the cost of entry, if we didn’t have S as well, I probably wouldn’t go here with a one year old. I think he would have been bored faster if he didn’t have S to copy, and the play area was great, but we could go to a play center for that. 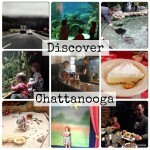 If you only have time for one of the Mobile attractions for kids, then this is what we would recommend. We stayed at Mictotel Inn and Suites across the bay at Daphne. It is a nice looking hotel and more upmarket than our previous stays. The room was nicer and not as basic as our previous motels, but everything was still minimal. Unfortunately, the walls were paper thin – we could hear our neighbours talking and watching tv. We weren’t happy when the alarm was set to go off early in the morning either! Microtel Inn and Suites Daphne double room with breakfast, wifi, fridge, microwave $69 including tax. We spent our budget of $136 perfectly including the $34 museum entrance. The Mobile AL things to do with kids were a hit! The kids loved the science center and they were happy to run around the fort. They were a bit upset at another one night stop though (its the third in a row), so we will try to cut down one night stops in future. Mobile was smaller than we expected and more run down. It was also very quiet which stopped it having a good vibe. It definitely has a lot of potential, but there just were not enough people around to give it the type of atmosphere that I enjoy and it felt too vacant – I wish we had come at a different time of year. I am glad we stopped here to try something different, but I can’t see myself returning. On the upside, we did enjoy the more kid focused things to do in Mobile for kids. We did enjoy some of the other attractions we visited in Alabama later in our road trip though! Onto our next stop of New Orleans! You can read more about this section of our road trip in driving Miami to New Orleans. What are your favourite attractions in Mobile? Did I just go at a bad time? Don’t you just love how they give you two big beds in hotel rooms in the US??? For sure! 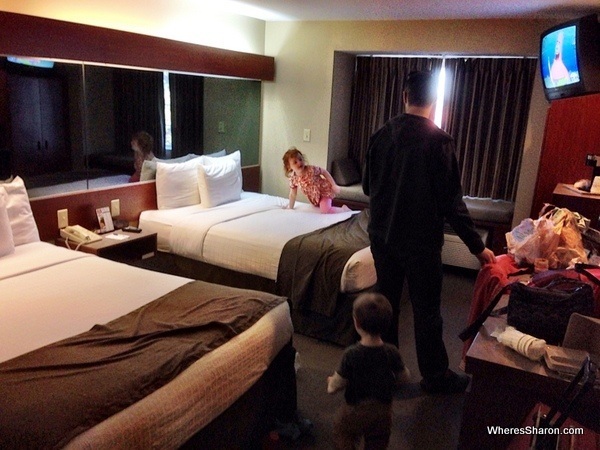 It makes this family travel thing so much easier. OK, strike Mobile, straight on to LaFayette ( New Orleans is booked out because of Mardi Gras right now). Good timing or bad timing? Not sure. We’ve only got 8 days left before end of USA road trip, flying to El Salvador,. I’ll be all over your El Salvador section shortly! I have only been to Santa Ana in El Salvador but it was great!! I have spent a lot of time to Guatemala and have been there many times. I have also travelled all around Honduras and a bit of Nicaragua so happy to help out with any planning 🙂 I hope you get to see a little bit of New Orleans, such a fabulous place. Being im from Mobile AL this article is very upsetting. 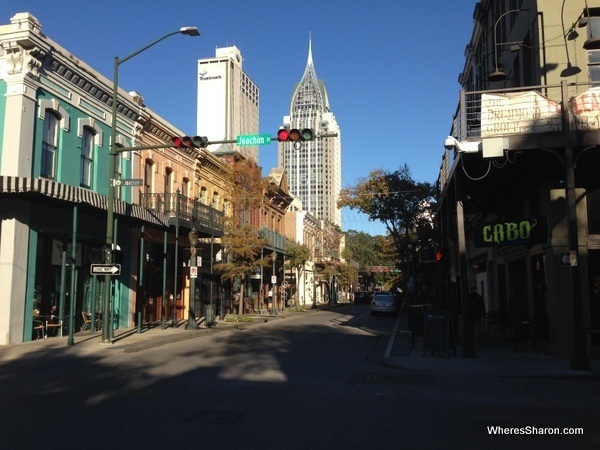 Mobile is a very beautiful, lively city that has alot to offer. Mardi Gras was founded in Mobile and is a very big deal. Mobile as well as New Orleans our downtown scene is very similar. New Orleans also has houses above there dt buildings. On dauphin st Mobile does not have “houses” we have roof top apartments and condos above the studios and bars. Im sorry you came at a bad time but i think its worth a trip back. Sorry to upset you, Amanda. I would definitely be up for a trip back. I would love to know any tips for when is a good time to go and what to see or do. I also am from Mobile and am also rather annoyed by this article. No, we are not as big or touristy as New Orleans, and articles like this that discourage visiting, will only make things worse. I would like to point out that it is extremely unfair for us that you did not **begin** this article with the disclaimer that you were here on Thanksgiving weekend – a time people spend with their families (and extreme shopping, but anyway). It gives a false impression that isn’t entirely negated by a sentence hidden in the middle of the article. Black Friday, for better or worse, is the biggest shopping day of the year – even here! Of course there was no one out and about downtown! Downtown is more social, less commercial, and mostly locally owned, so these business close so that their employees can enjoy the holidays. There is plenty to do on a typical weekend. We have festivals throughout the year, farmers markets every Sunday in warm months at Cathedral Square, downtown art exhibits the second Friday evening of every month. There is the carnival musium, historic home tours, and Battleship Park where you can explore the USS Alabama, submarines, and fighter planes. There is so much heart in our city; don’t write us off! Please, for the sake of my beloved city, do some research, add a disclaimer, and don’t discourage other’s from visiting. Hi Sarah! Thanks for your thoughts and suggestions. I wish we had come at a different time of year!! Being Australian, we didn’t know how Thanksgiving would affect things – it is very different in city centres and long weekends here. I actually tried to do a lot of research about how Thanksgiving would affect the different places along our route but it is not easy to find out anything. I think people just assume that other people know what difference it will make. Anyway, I wrote something about the long weekend at the beginning of the article 🙂 We absolutely loved our Deep South road trip. By far the highlight of all the US travel we have done. This is great! We want to visit all 50 states and I was trying to find things to do for each one. I’m hoping to plan a USA road trip in the next few years. Great challenge! I hope to get to every capitol building in my life 😀 Enjoy! Being from Mobile, I too am a bit aggravated by your review. Our city is not “Run down” we preserve history and do minimal updates to historic structures. Inside these buildings, however, you will discover amazing architecture that would most definitely change your mind of us being “run down”. I think you may have misinterpreted the phrase “comparable to New Orleans” we are not a touristy party City. Our roots and history are similar. I would never take children to a place that I thought was “comparable to bourbon street” obviously, your research was a skimm. Also, it is hard to review Mobile, Al when you only went downtown, up Government, and stayed at a motel across the bay. Did you check out Battleship park, Dauphin Island, the Botanical Gardens? 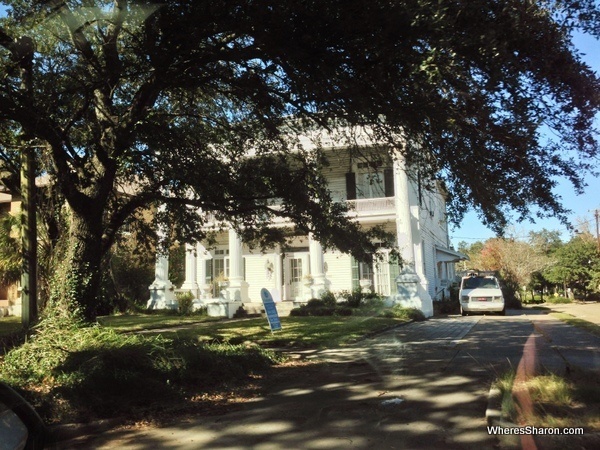 Did you you take a drive through the Bayou, eat fresh gulf seafood, or take a Duck boat tour? All of these things are very enjoyable to kids. I have 5 myself and can always find something local and affordable to do with them. I think it is very unfair to have reviewed our city the way that you did under the circumstances that you were here on a holiday weekend and only mentioned your visit to two streets and a motel in Daphne… Maybe next time come with a better budget and your experience will be better. $136 for a family of 3+ is beyond unreasonable anywhere you go. ?